Elena will star in her own TV show airing on Disney Junior in 2016; but will be meet her on an upcoming episode of Sophia The First. What Disney has shared about Elena is that she is a confident and compassionate 16 year old , she has a little sister named Princess Isabel, her grandfather Tito, and her grandmother Cici. (where is her mother?) She also has a best friend named Mateo and while trying to save her family from Shuriki, Elena was pulled into her own magical amulet. Princess Sofia is wearing the amulet now will restore Elena to her human form and helps her return to Avalor. Too cute! I love the fact that she is also voiced by a Latina actress Aimee Carrero who is on ABC Family’s Young & Hungry. She is Dominican and raised in Miami. 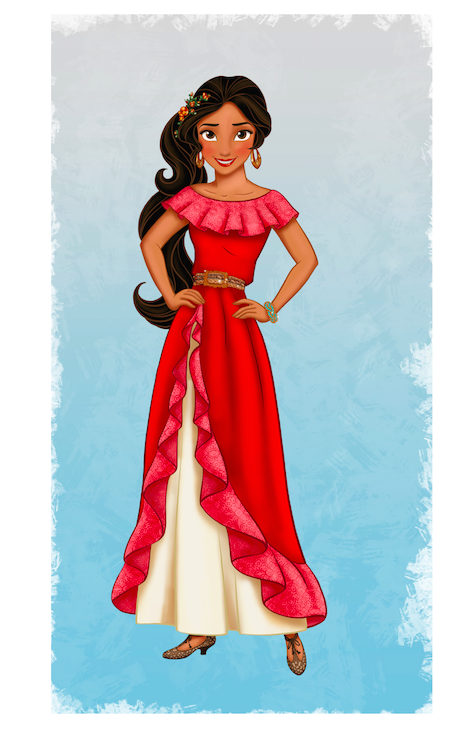 Looking forward to meeting Elena of Avalor soon!